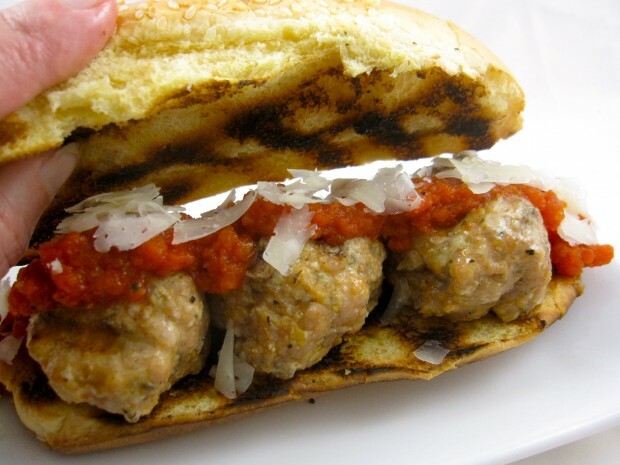 Nothing shouts football louder than a meatball sub. The sandwich — brown-flecked porky pigskins in a bun posed for trajectory — even resembles the sport. I’m turning down the volume on this sub recipe, injecting Spanish notes to the traditional favorite. Lord knows I need some calming down, for instance, after that Notre Dame game. Five minutes of losing, winning, losing, winning — I need to rebalance my energy field; all of this testosterone-laced adrenalin has my system out-of-whack, and my hormones need realignment. Therefore, for the San Diego State game, I ratcheted down the tailgate favorite with a bit of cosmopolitan intrigue — think Penelope Cruz out on the town with Denard Robinson. I adapted the Smoky Grilled Meatball Subs recipe from Fine Cooking Magazine, which was originally written by Samantha Seneviratne. Spanish manchego cheese is used instead of the more typical Italian grates. Roasted Red Peppers and grilled tomatoes, pulverized in a food processor and seasoned with Spanish smoked paprika, replace the sub’s basic tomato sauce. There are alot of last minute tasks before bringing the subs to table, so I made the sauce a couple of days in advance. I reheated it before spooning over the meatballs, hot from the grill. My results yielded fewer meatballs than the The Fine Cooking recipe, but it was plenty of meat for four subs. You may want to begin with less smoked paprika, salt and chili pepper flakes than the recipe calls for. After combining the ground pork, soaked bread and spices, microwave or sauté a teaspoon, then add additional seasoning to your taste. A word about sub rolls: I’ve used a variety of artisan rolls when making subs and po’ boy sandwiches, yet I keep returning to the ubiquitous soft sub rolls lining grocery shelves across town. The heft and chew on the wonderful hand-crafted rolls is often too much bite for the sandwich fillings — by the time I gnaw off a piece of bread, the ingredients take a tumble into my lap. I imagine the soft roll as an edible blanket; a vehicle for eating the sandwich without spillage. It would be a fine idea to forgo the bread altogether. Simply skewer the savory meatballs, topped with sauce and cheese with picks or skewers. Touchdown! Tear half of one roll into 1/4-inch pieces and put in a small bowl. Add 1/4 cup water and let sit until the bread has absorbed the water, about 5 minutes. Gently squeeze the bread to remove excess water and finely chop the soaked bread (you should have about 1/4 cup). In a large bowl, break up the pork with your hands. Add the soaked bread, egg, garlic, lemon zest, thyme, smoked paprika, 11/4 teaspoons kosher salt, and 1/2 teaspoon freshly ground pepper pepper. Combine well and shape into 12, equally-sized meatballs. Split the remaining rolls, but don’t cut them completely in half. Brush the insides of the rolls with 1 tablespoon of the oil. Brush the cut side of the tomato and the meatballs with the remaining oil. On a clean, well-oiled grate, grill the tomato until softened and lightly browned, turning once, 4 to 6 minutes. Grill the bread split side down until golden and lightly charred on the edges, 1 to 3 minutes. Grill the meatballs until just cooked through, turning once, about 8 minutes. Place 3 meatballs in each roll and top with one-quarter of the sauce and one-quarter of the cheese. Serve.